← #39 – Yr Wyddfa (Snowdon) via the Rhyd Ddu and the Snowdon Ranger Paths. Wales has dominated the scene for last few weeks, both in the blog and on the walks, and no bad thing either. However, a rich diet of Welsh hills sometimes needs something a bit simpler as a contrast. We had to visit Hebden Bridge a couple of times during the week, so a couple of walks on the moors of West Yorkshire seemed to be indicated. In 2005, Hebden Bridge was described in the British Airways magazine as “the fourth quirkiest place in the world”, probably due to the influx of artists, writers, photographers and green activists in the 1980’s – the town is also surrounded by great walking country. Just line up the cairns and go…. 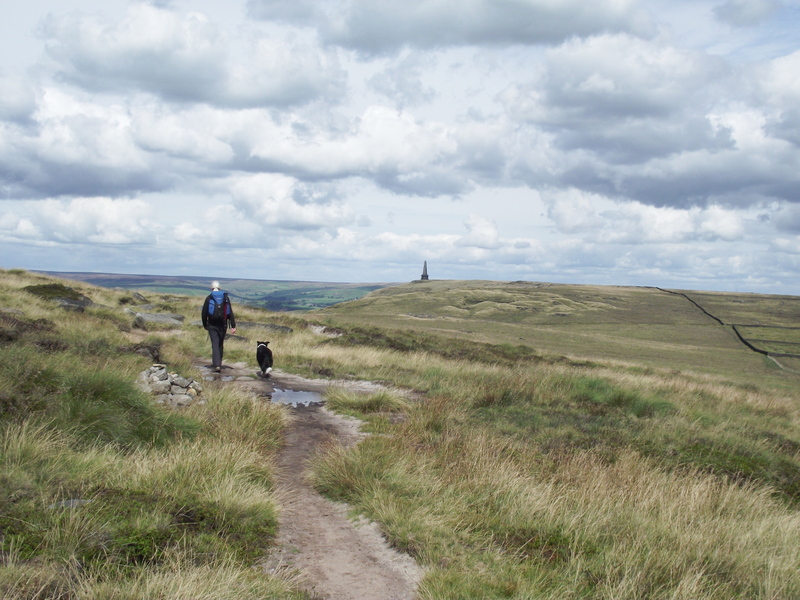 The first walk started from Crag Vale, just down the road from Hebden Bridge. 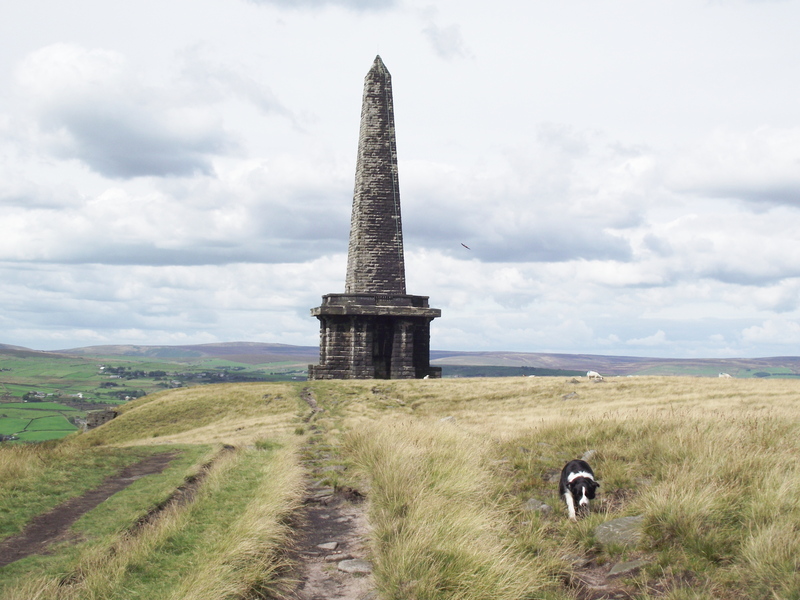 The main objective was Stoodley Pike Monument, which is usually tackled from Todmorden, making a shorter walk. 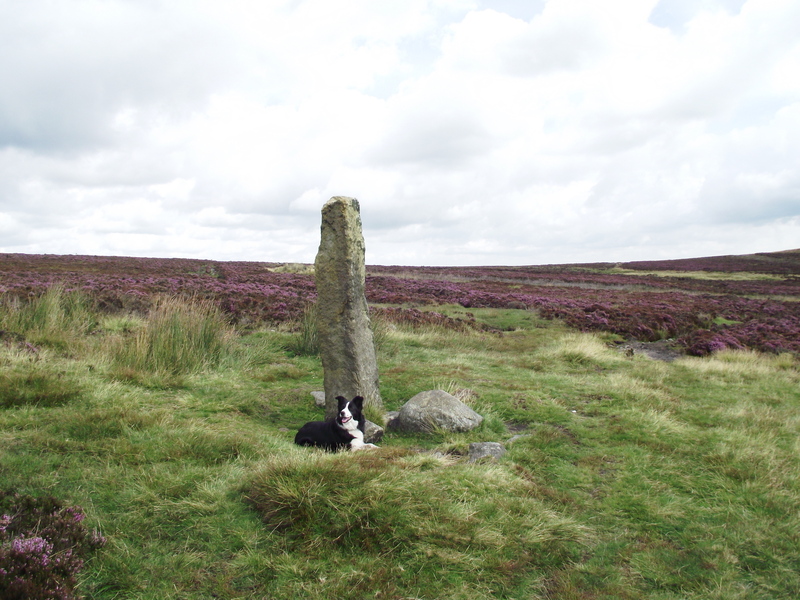 First landmark of the day was the “Two Lads” cairns on Higher House Moor. We had to cross rough, untracked Pennine moorland to get there, but distinctive features like this are great for navigation. Before we left the Lads I noticed that if you sighted along them, they pointed directly to the next landmark – how convenient is that? The next landmark being the Cloven Stone – well, no mistaking that then! 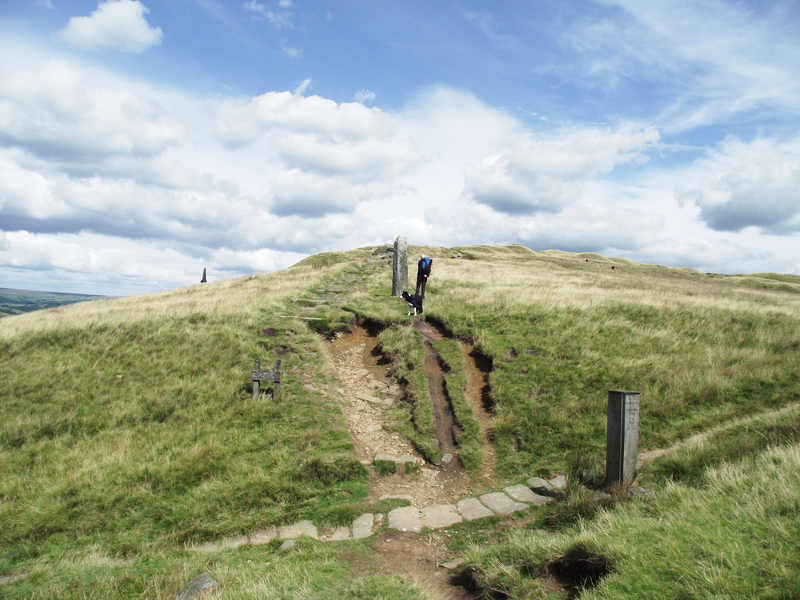 No danger of losing the way from hereon either – The route follows a path next to a drainage ditch collecting water for one of the nearby reservoirs, and links up with one of the best known trails in the country, The Pennine Way. 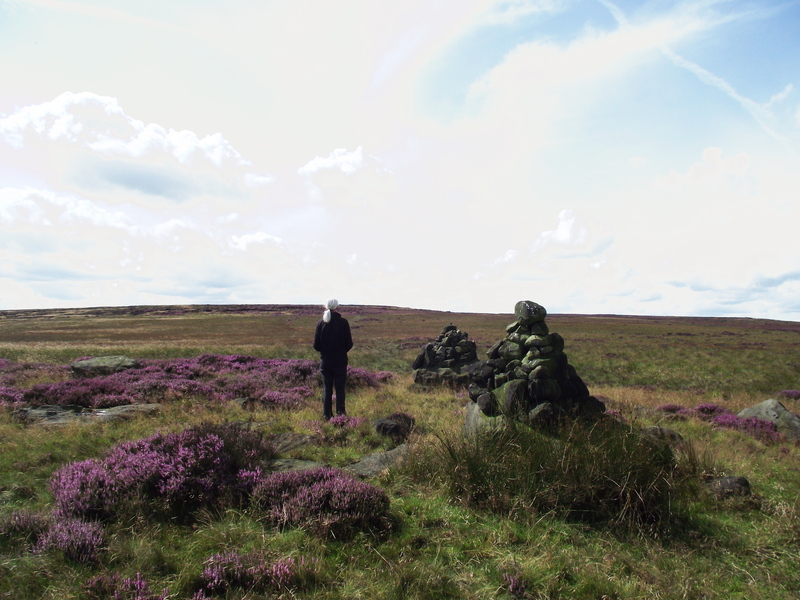 On the Pennine Way we crossed over a much older way, the packhorse route from Crag Vale to Todmorden – the causeway stones marking the route looked as though they had survived several decades of horse traffic. Soon after that we were at the monument at Stoodley Pike, built to commemorate victory in one war (the Napoleonic war) and rebuilt during another (the Crimean War) following it’s collapse after being struck by lightening – it now has a lightening conductor, apparently! 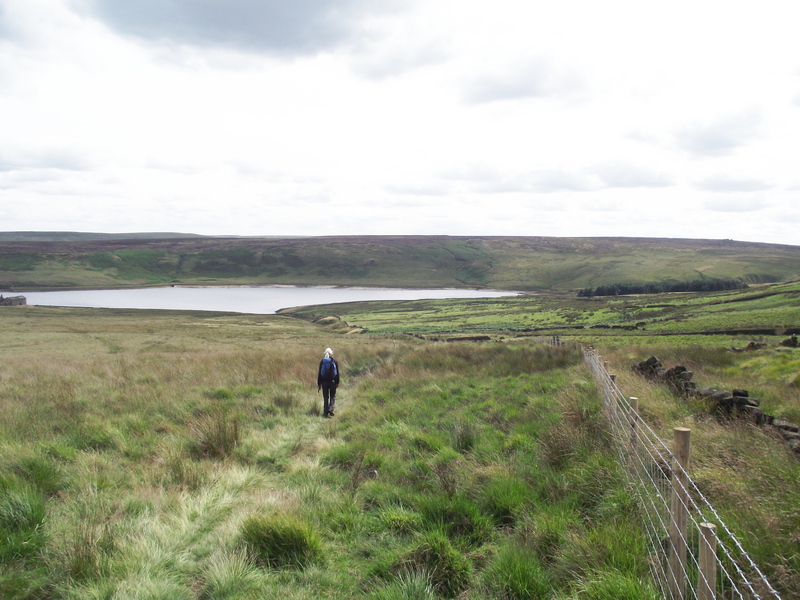 The last section was an easy wander down towards the reservoir at Withens Clough. 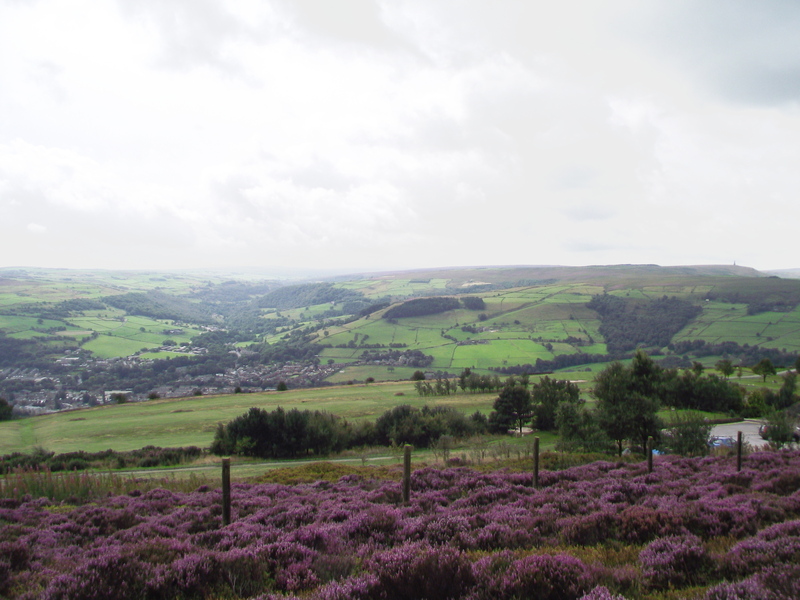 Our next trip, two days later, started from near Hebden Bridge, high above the Calder Valley. 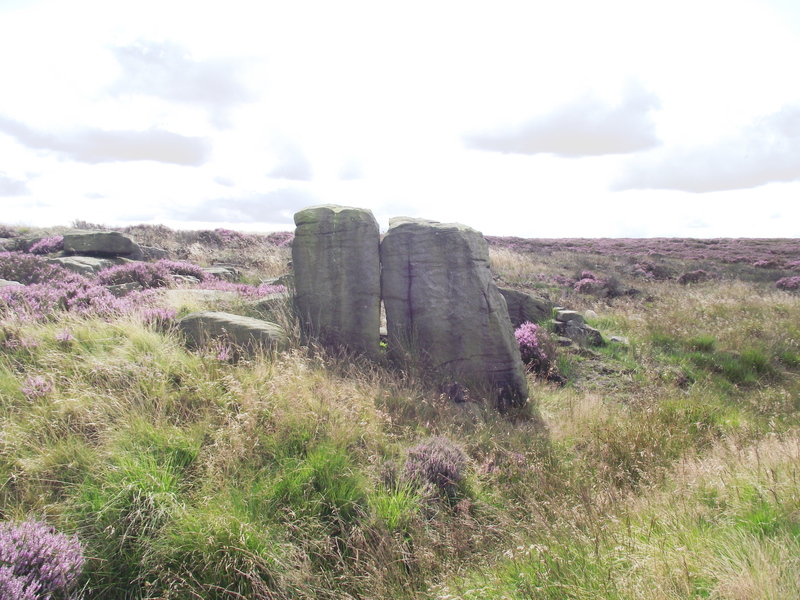 We were heading for Warley Moor, passing the standing stone known by the unusual name of “Churn Milk Joan” – theories abound about the stone, but it is most probably a boundary marker. 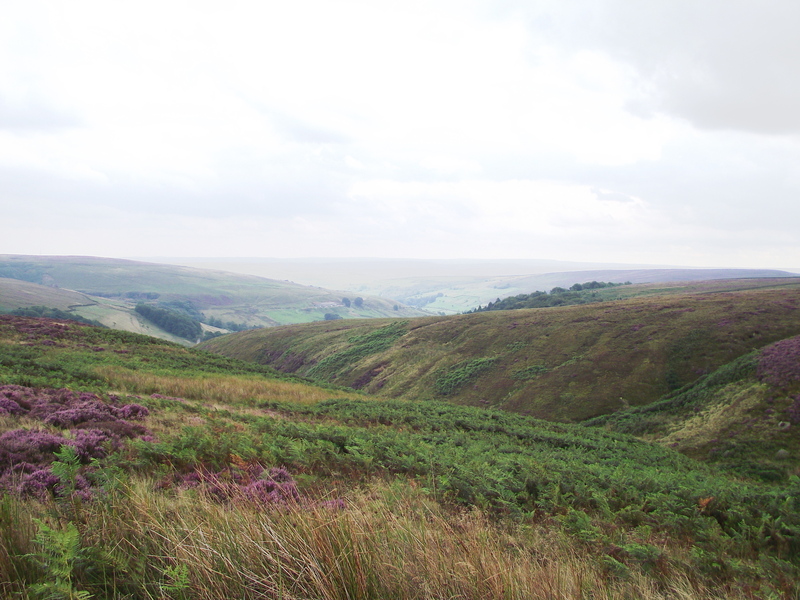 Not far after that we had an obstacle in our way – the Luddenden Valley! To get to Warley Moor we had to lose 100 metres of height, which then had to be regained. As with most things in life, it wasn’t really all that bad – the descent was steep, but a winding track helped us regain the lost height. 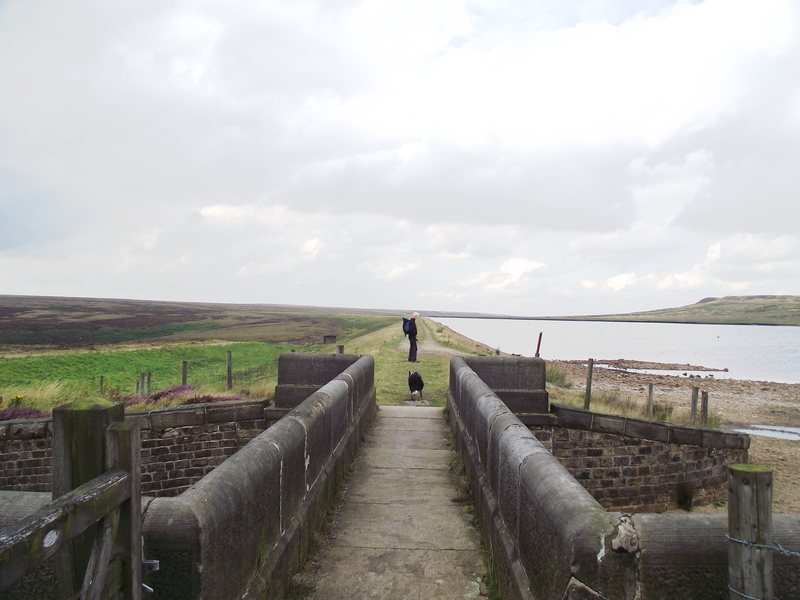 A lengthy stretch of plodding up a gradual rise brought us to Warley Moor Reservoir, where the dam was a useful link for the return route, following another drainage ditch (well named as “Catchwater Drain”) high above Luddenden. The Catchwater Drain path allowed fast, easy walking, but after almost three kilometres of this we were ready for a change. 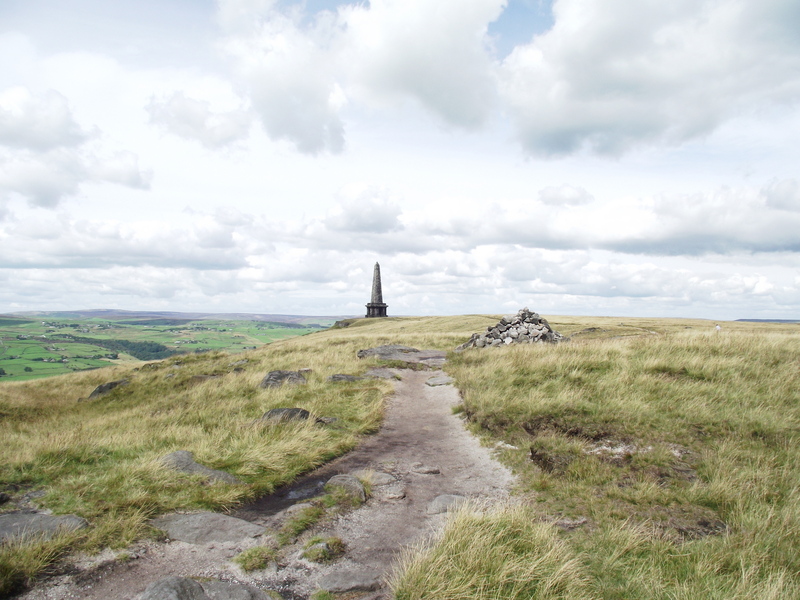 A gentle climb brought us to “High Brown Knoll”, our highest point of the day at 444 metres, before a steady descent back towards Hebden Bridge. 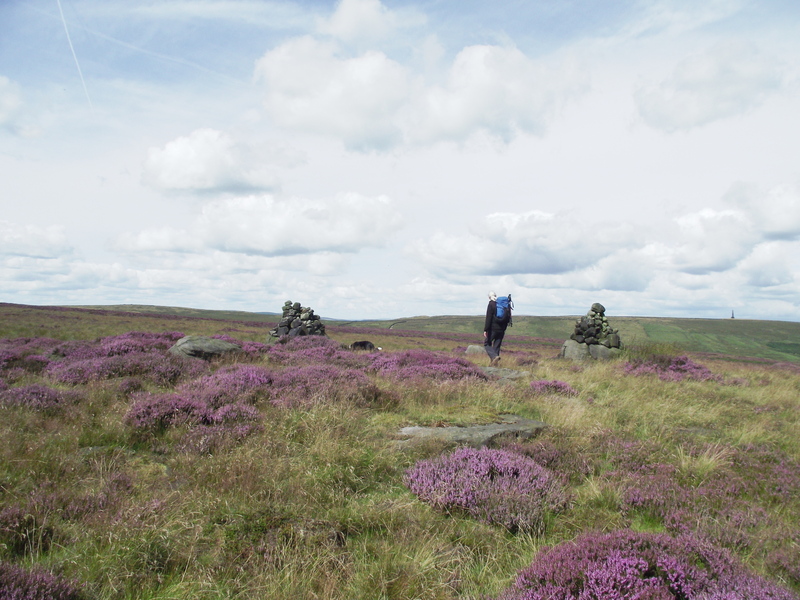 Two typical Pennine days except for one thing – no rain! This entry was posted in 4. 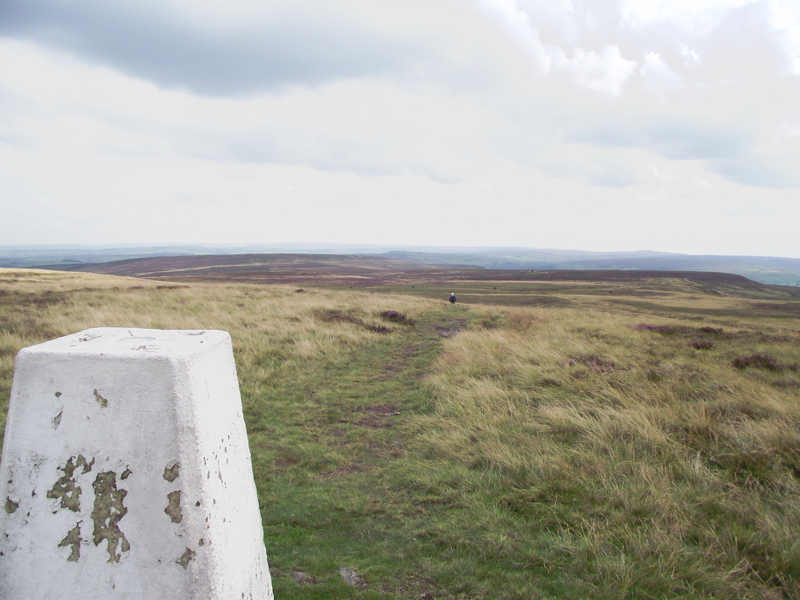 Northern England and tagged hillwalking, Pennine Way, Yorkshire. Bookmark the permalink. Good views across into Lancashire…………. Hi Paul. Have you ever ben in French Britanny? The photos of the plain remind me of it a lot! Yes, I know what you mean. Les Monts d’Arrée look similar to our Pennine Moors, though the rock there (from what I remember) is quite different. I haven’t walked much in inland Brittany, other than round Huelgoat, but I love the coast, especially the southwest. A day walking there followed by a Fest Noz must be as near to a perfect day as you could get.